‘To philosophize is to learn to die’, writes Michel de Montaigne, in a lineage of death-preoccupied thinkers reaching back to Plato’s Socrates. Can philosophers fulfil such a lofty injunction? How might learning to die teach us how to live, or how to live-on while mourning another’s death? 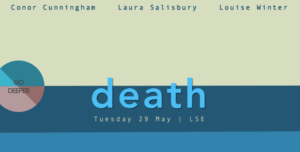 We bring together practitioners and thinkers to discuss how medicine, technology, art, and philosophy might make a good death possible. Quick accessibility map here. Full access information for the Old Building in general, and the Old Theatre in particular, available here.